We are delighted that Bruntwood selected Dortech to design, manufacture and install over 250m2 of architectural glazing systems at Baskerville, one of their Manchester city centre properties. 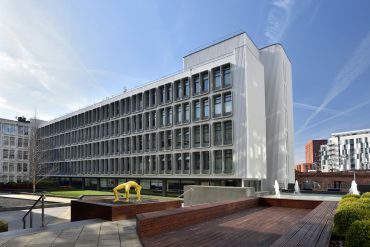 This upgraded building now houses the headquarters for electrical retailing giant, AO.com, who have recently consolidated their Manchester operation by taking the whole of Baskerville House at Bruntwood’s Riverside office complex. The overall scheme was designed by Bridge Architects and incorporated Technal MX, visible grid curtain walling throughout. Saint Gobain Planitherm Ultra Nii Heat Soak Toughened Glass was used throughout, with glass spandrel panels to non-vision areas.